More than just a good meal, you actively search for the best restaurants when on holiday. You want not only the ones everyone is talking about, but to find those hidden gems. You probably cook quite a bit at home, too, and know more than just a bit about food. You’re a certified foodie. And now you’re coming on holiday to Byron Bay, so you want to know about Byron Bay restaurants. We like to keep abreast of the newest and best restaurants in Byron Bay, too. So here we’ve taken inventory of places to eat in Bryon Bay and highlighted those that will make your foodie soul happy—places here in Byron Bay, some not far outside of town and worth the visit, and a few new ones that should be on your list, too. This relatively new small eatery focuses on healthy food as well as coffee, smoothies and cold-pressed juices. It offers a relaxed setting in a cute cottage away from the town centre, off Ewingsdale. It has both indoor and outdoor seating, and don’t be surprised if people are just milling around the front yard, siting on anything from benches and milk crates, to the grass. It would be a great place to grab breakfast or lunch. Follow the restaurant on Instagram so you can drool over the delicious concoctions they create. Open 7 am to 2 pm for breakfast and lunch Monday to Friday, this modern, industrial café is located in the Arts and Industry Estate. 100 Mile Table’s menu changes fairly regularly based on what produce is available locally, but many of the popular standards stay on the menu (such as ham and cheese jaffies or crispy pork belly roll with Asian pickles). The café serves Marvel Street Coffee as well as freshly squeezed juices and other beverages. Watch for one of the café’s pop-up dinners where the banquet-style food is served on long tables. Coffeehouse and café by day, whiskey bar by night, Roadhouse serves up some of the best coffee and breakfast in the area. If you come back in the evening, you can try out any number of whiskeys as there are more than 450 bottles in the collection. So keep this in mind if you want to bring out the liquid side of your foodie personality! Try out either the morning pick-me-up in the form of excellent Byron Bay coffee, or perhaps stop in for a whiskey during the evening. And by the way, the food is pretty good, too! Located just outside of Byron Bay in Ewingsdale, this restaurant from the Sydney Three Blue Ducks encourages visitors to explore the surrounding farm where they raise and grow much of what they put on the menu, along with fresh seafood and other local sourced food. The kid-friendly restaurant is all about the local and a hands-on concept from building their own tables, to finding local produce that is spray free. The menu changes with the seasons and what the owners/chefs can find locally or on the farm. Another unique part of this concept restaurant is the bar. With 56 taps of Australian craft beers and mostly organic/biodynamic wines, the owners hope to minimize waste, fewer bottles, and maintain freshness. And so far, the concept seems to be working with demand for seating high. So be prepared to wait—probably a great place to meet locals—but that gives you a chance to explore the farm, visit the florist and check out the store where you can buy fresh organic bread from the Bread Social (next door to the restaurant) and milk when you finish your meal. There’s even a kids’ playground to entertain the littles after they look at the chickens and pigs. Breakfast and lunch is available seven days a week from 7 am to 3 pm, and dinner is served from 5 to 9 pm Friday through Sunday. This small restaurant—seats only 21—opened last March in Brunswick Heads and features a compact, but excellent, wine list and a menu heavily focused on local food found at the farmers markets. Owners Astrid McCormack and Josh Lewis previously turned heads with the restaurant Loam, and now the pair is pushing the envelope with Fleet. Come with a fellow foodie friend, partner or family member and plan to share the Kitchen Picked Share Menu for $65 per person that pulls from the daily menu. Fans of great coffee should make sure to add Table View to their list of must-do Byron Bay dining. Brothers Marc and Allen Shubitz opened this coffeehouse in Brunswick Heads and serve specialty coffee seven days a week. They focus on Byron local roastery Marvell Street Coffee, and the menu contains a variety of coffee drinks as well as locally sourced items, such as eggs on toast variations and Hayters bacon. If you’re up for a little road trip for good food in an intimate setting, set your course for Harvest Café in Newrybar. The menu changes seasonally, depending on the availability of fresh produce. The chefs at Harvest Café utilise only organic and sustainable food to create all the menu offerings. For example, a recent dinner menu featured starters such as roast bone marrow, grilled octopus and ox tongue. A great main dish to share is the 12 hour braised lamb shoulder for two, zucchini, salted ricotta, grains and Daisy’s mint sauce, yet another delicious offering on the Byron Bay dining list. An excellent day trip from Byron Bay, Mullumbimby is a fun town. While you’re there, you must grab a slice of pizza at Milk and Honey—it’s not only a local favourite but on travel writers’ must-do lists. This popular wood-fired pizza joint doesn’t stick with the tried and true options. Here you’ll find such intriguing choices as roast pumpkin, ricotta, salsa verde and parmesan or hot salami, bottarga, olives, chilli, garlic, tomato and mozzarella. Over the last three years, Milk and Honey amped up its menu offering, taking it from an already tried-and-true place to eat in Byron Bay to a certified foodie destination. This Byron Bay bakery, opened about a year ago, is a place for foodies to indulge in delicious pastries, treats, breads and hot items. Everything is made from scratch using organic products as well as locally sourced ingredients. The breads are made fresh each morning and range from traditional sourdough to rye and wakame bread. The owners are couple Greg and Angie Wilton who started out selling fresh pastries at the farmers markets in 2010 and grew to a bricks-and-mortar store in Mullumbimby and online shop. Town is in super hip Bangalow, just a short 15 minute drive from Byron Bay and worth the trip. Named one of the Hot 50 Restaurants in Australia in 2013, Town sits in one of the beautiful buildings on the main drag, Byron Street, and is split into two sections – Downtown on the street level for coffee, breakfast and lunch and Uptown on the upstairs level for dinner at night. If you want a great breakfast or lunch while visiting Bangalow, then stop by Downtown. However, if you’re in for an amazing evening, then make a point to try a dinner at Uptown where you can experience a six-course degustation menu. Set at $85 per person, you won’t leave disappointed—or hungry. This is a tour for the foodie in you. Offering up three variations for you to choose from, Nourish Food Safaris will literally provide you the chance to taste the variety of culinary treats available in the Byron Bay region. Bay Gourmet: This premium tour happens almost every Friday from 1:30 to 4:30 pm (approximately). The walking experience starts at Targa Restaurant and will give you a taste of Byron Bay’s range of local food. Cost $119 per person and includes food and alcohol. Run by Taste Byron Bay, this unique tour involves shopping, coffee, food and even beer. Sounds like a perfect holiday day, and one that is carefully researched and prepared so you don’t have to do anything except show up. Beginning with a welcome coffee at the Eatery on Jonson, the tour leaves at 9:30 am on Sundays (tour guests are encouraged to get there by 9:15 am). Tour guides will drive guests to Bangalow and Brunswick Heads to enjoy shopping at some excellent boutiques then lunch will be served at Clem’s Cargo. There you’ll enjoy not only fresh oysters, but also plenty of local produce as well as local brewed beer. You will return to Byron Bay at 2:30 pm. Cost is $160 per person. Save money for your foodie adventure at one or all of these Byron Bay restaurants by staying at our budget-friendly accommodation: Broken Head Holiday Park. 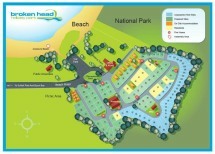 We offer several types of holiday accommodation from non-powered campsites to beach shacks. By staying with us, you’ll have access to great facilities and a beautiful setting to make your home base during your holiday. So book a holiday stay at Broken Head, and start your foodie trip to all the excellent places to eat in Byron Bay!